Gerald Wexler (1917-2008) was born in The Bronx to an immigrant family of German-Jewish and Polish-Jewish background. He graduated from high school by age 15, but there was little to do in the difficult days of the Great Depression. Wexler spent much of his time with a small circle of friends listening to music and discussing literature. It was only after returning from World War II military service that he finally pursued a career in journalism and music. He got a job as a reporter for Billboard Magazine, and soon became its editor. At the time, the magazine had a separate music chart for “black music”, called “Race Records”. Wexler took a stand against racism and came up with a new title, renaming the chart “Rhythm & Blues”. He thus coined the now popular term “R&B”. In 1953, the president of the start-up Atlantic Records (a fellow Jew named Herb Abramson) was drafted to the US Army. Wexler was offered to take his place. Under Wexler’s leadership, Atlantic Records became one of the world’s most successful music labels, and produced some of the biggest names in music, including Ray Charles and Aretha Franklin. For bringing the latter to the world, Wexler was named Record Executive of the Year in 1967. (Franklin had struggled to find success in music until Wexler convinced her to join him at Atlantic, and produced her breakout hit song, “Respect”.) The following year, he signed a young group called Led Zeppelin. Wexler would go on to work with other big stars, including Bob Dylan, the Bee Gees, Richard Pryor, Carlos Santana, and George Michael. He was inducted into the Rock and Roll Hall of Fame in 1987. Wexler played a central role in ending the era of “race music” (and stopping the practice of white musicians covering songs of black musicians and raking in all the fame and fortune for themselves). He opened the door for more “black music” to enter the once all-white Billboard charts, and has been credited with bringing “black music to the masses”. Not surprisingly, Wexler has been called “a prophet of roots and rhythm” and “the Jewish king of black music”. Music is the pen of the soul. This entry was posted in Arts & Entertainment and tagged American Jews, Aretha Franklin, Atlantic Records, Billboard, German Jews, Journalism, Led Zeppelin, Music, Polish Jews, Ray Charles, Rhythm & Blues, Rock and Roll Hall of Fame, The Bronx on August 23, 2018 by Jew of the Week. Leonard Norman Eliezer Cohen (1934-2016) was born in Montreal, the grandson of a Lithuanian rabbi and a Polish immigrant who founded the Canadian Jewish Congress. Cohen grew up very close to his Jewish community, and attended Montreal’s Jewish Herzliah High School, where he was first inspired to take up poetry by a teacher. While studying at McGill University, he published his first set of award-winning poems. 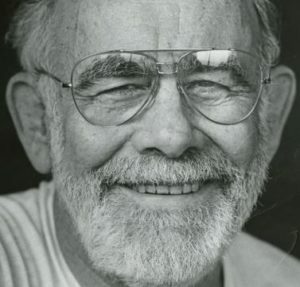 His second book of poetry found even more success, and was seen as an important work in Canadian literature, with one critic calling Cohen “the best young poet in English Canada.” Cohen moved to a small island off the coast of Greece and wrote prolifically, publishing several more books of poetry and novels. One of his later books – a Literary Award winner – was inspired by the Hebrew Bible and consisted of 50 poems that Cohen called “prayers”. Meanwhile, Cohen started recording music in the 1960s as poetry did not bring the income he hoped for. His first album was a big hit in the US and UK. 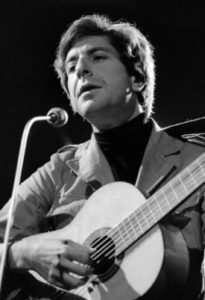 It was his seventh album that had his most famous song, “Hallelujah”, which Cohen went through some 80 drafts writing, and “banging his head on the floor”. The song was inspired by various Biblical scenes, including the stories of Samson and Delilah, and King David and Batsheva. It would be covered by over 200 artists in dozens of languages, and become the subject of a whole book and BBC documentary. In 1994, Cohen entered a period of five years of seclusion during which time he was ordained a Zen Buddhist monk. However, he never abandoned his Jewish roots, and said, “I’m not looking for a new religion. I’m quite happy with the old one, with Judaism.” Cohen was known to keep Shabbat throughout his career, even while on tour. In his 2009 concert in Tel-Aviv, Cohen spoke Hebrew and ended the concert with Birkat Cohanim, the priestly blessing. During the Yom Kippur War, Cohen went to Israel to volunteer at a kibbutz before going to the front lines himself to entertain Israeli soldiers, saying he will “stop Egypt’s bullets”. In his 1972 Jerusalem concert he was so emotional that he had to walk off stage at one point. The crowd started singing to bring him back and a teary-eyed Cohen felt like “the entire audience turned into one Jew”. All in all, Cohen produced 15 albums (the last of which was released just three weeks ago), 13 poetry books, and two novels. He won a plethora of awards – including multiple Junos and Grammys, the Order of Canada, and induction into the Rock and Roll Hall of Fame – and inspired countless musicians, poets, and artists. He has been hailed as one of the most influential songwriters and greatest musicians of all time. Sadly, Cohen passed away earlier this week. 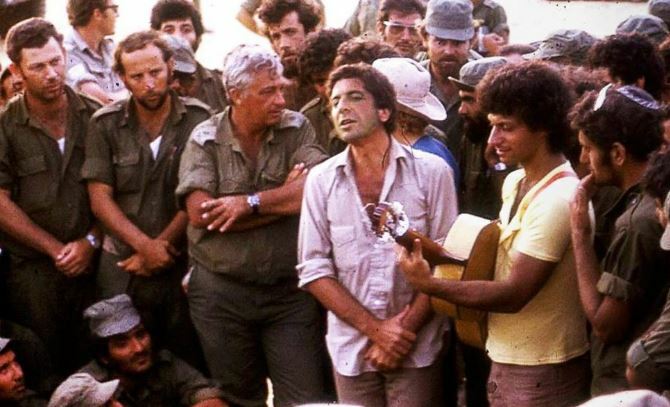 Leonard Cohen performing for the IDF, with Ariel Sharon looking on. This entry was posted in Arts & Entertainment and tagged Bible, Buddhism, Canadian Jews, Grammy Award, Hallelujah, Israel, Jerusalem, Juno Award, Kibbutz, McGill University, Montreal, Order of Canada, Poets, Rock and Roll Hall of Fame, Shabbat, Tel Aviv, Yom Kippur War on November 11, 2016 by Jew of the Week.